Is there anything sadder than being on the last day of an amazing vacation and getting an email saying that your flight is ready for checkin? All of the crying emoji. In the morning, we got coffee and a breakfast sandwich from a nearby cafe and noticed that there was a large flea market going on in the parking lot right by our friends’ apartment, so we went to check it out. Kurt picked up a few various odds and ends, including some Scandinavian candlestick holders and a wall hanging. Since it was such a nice, sunny day, we decided to go to the nearby Copenhagen Zoo. I will fully admit that one of the reasons I was interested was because my friend Dani had a Game of Thrones celeb-sighting there once; she saw the actor who plays Euron Greyjoy while he was there with his kids. While we didn’t end up spotting any Danish actors, we saw something I was possibly even more excited about. I can’t tell you how many times I’ve been to a zoo and the red pandas are hiding in the indoor part of the exhibit, out of sight from the crowds. I’d never seen one in person before. 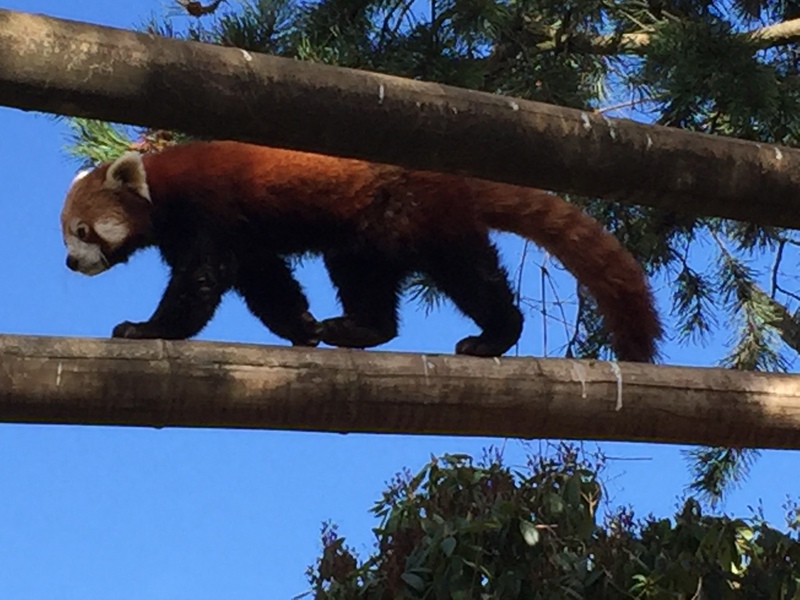 When we reached the exhibit, we were super lucky to see two red pandas actively exploring their habitat, climbing logs and using the fenced-in walkways that went over the paths like a habitrail. The up-close red panda viewing made my day. 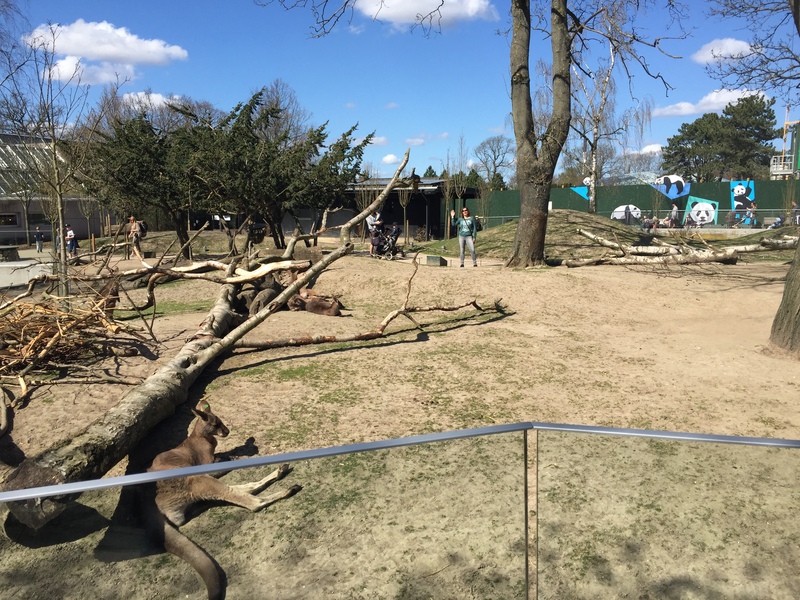 Denmark is big on protecting personal freedoms, and as I joked to Kurt, this carries over into how close they let you get to kangaroos in the zoo. To our shock, people can actually walk into the kangaroo enclosure where you’re kept on the trail by an ankle-high fence that the kangaroos obviously cross all the time. In the picture below, that’s me in the green shirt. 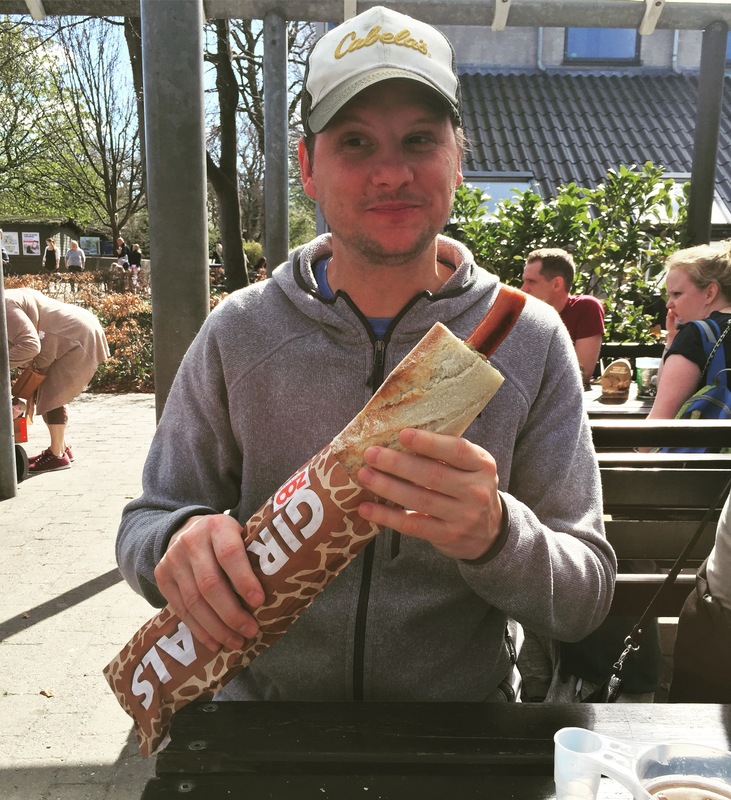 As an American who struggles with conversion to the metric system, I now have a new guideline: a half-meter-long hot dog is roughly equal to one-and-a-half feet of hot dog. 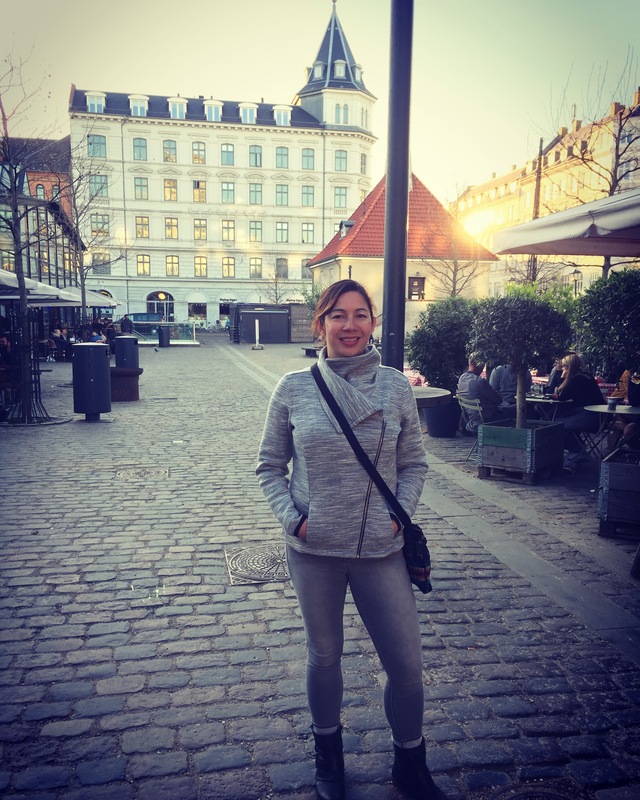 After exploring the zoo, we took a leisurely last walk through the Frederiksberg Gardens. Plenty of people were spending the day outside, laying on blankets enjoying picnics while their kids ran around and played by the ponds or on the rolling grassy hills. 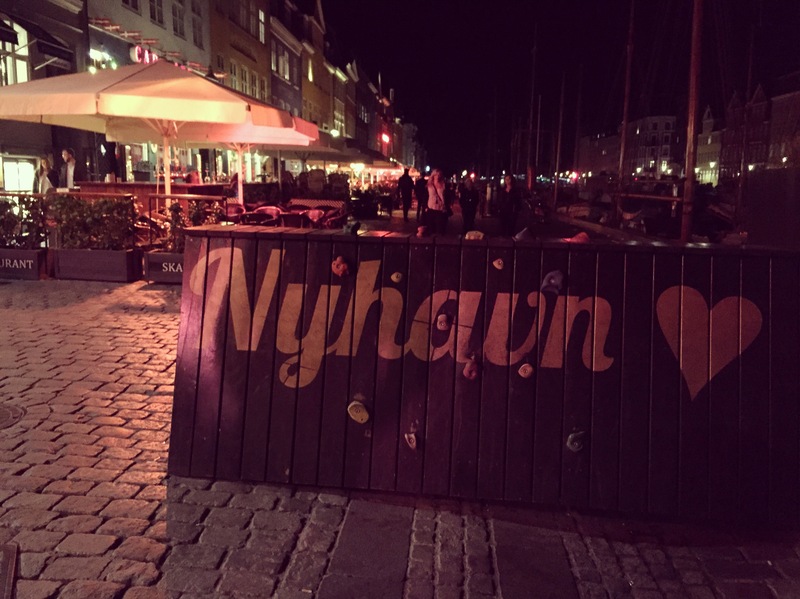 Copenhagen is an idyllic place to raise a family, a fact that our friends can attest to. For dinner, Kurt and I returned to Torvehallerne and ordered a charcuterie plate and a bottle of wine. Dani was able to meet up with us for our last night, and we had a nice evening out. From the perfect weather to the amazing scenery, fantastic company, and fun music, I couldn’t have asked for a more perfect final night.